Recently, I’ve been buying quite a lot of these packs of energy gels with water bottles. Firstly, it’s convenient to have lots of sachets for travelling and carrying in back pocket to top up water bottles during long rides. It saves having to carry around 1.5kg tubs. Secondly, buying a pack with a free water bottle, is a good motivation to throw away some rather manky looking water bottles that have been sitting around my cupboard for God knows how many year. 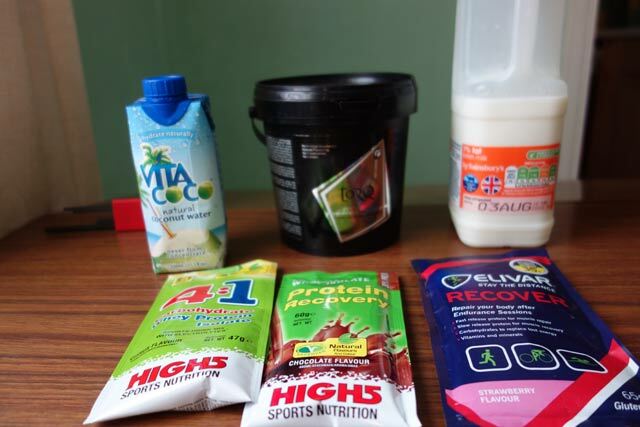 Generally, the packs are good value, and much better and more convenient than buying the odd gel and energy bar everytime you might need one. If you’re lucky, you might see some packs on special offers. It’s always worth checking with the manufacturer site, as they may give a free starter pack if you register with them. I know ZipVit were doing this for a while, but seem to have discontinued the practise at the moment. 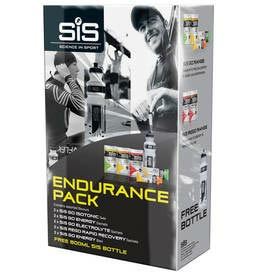 These are some of the endurance packs that you can pick up in cycle shops or online. 2 x SIS Go Energy Bars. 10 * energy sachets = £11.99 £1.19 per item. It could be more expensive to buy separately. I quite like this SIS pack and have bought a couple. There is a good mix of sachets and I find myself using all the different products. The water bottle is high quality and makes a good replacement for some old ones. The energy powder is based on maltodextrin/fructose 2:1 combination. 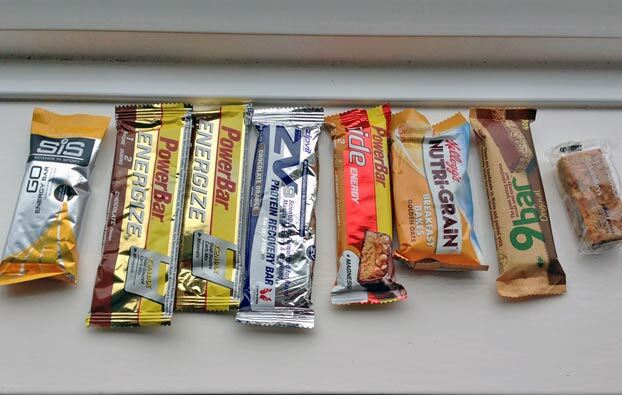 Over the years, I’ve taken a huge variety of energy bars and food on rides. These are a quick review some of the bars I buy most often. A selection of energy bars I have a the moment. I might take this kind of selection on a long 5-6 hour ride. 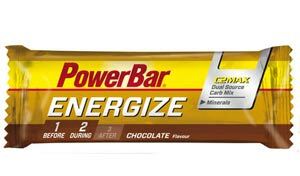 What to look for in an energy bar? High level of carbohydrate / low fat. Mostly complex carbohydrate, with some carbohydrate which sugars. Medium GI index. High concentration of energy for size. I tend to take a variety of energy bars. I’m not particularly fussy which brand. 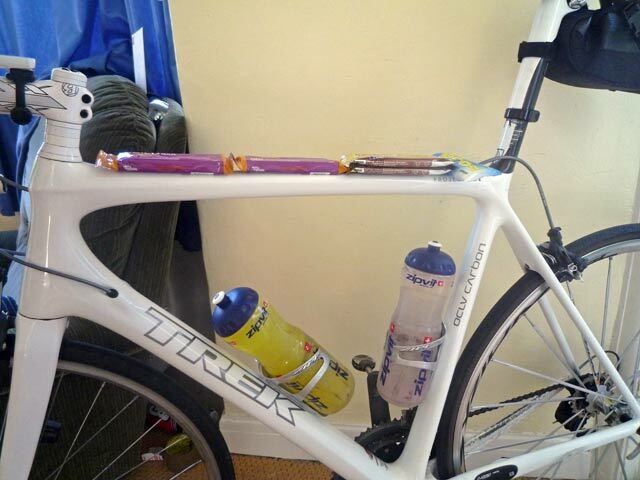 But, a bit of variety helps in various aspects – even if just making eating of the bike more palatable. 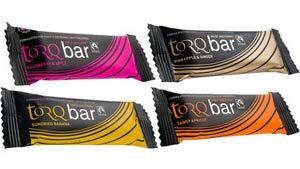 For a specific energy bars developed for the cycling market, you will pay around £1 – £1.50. 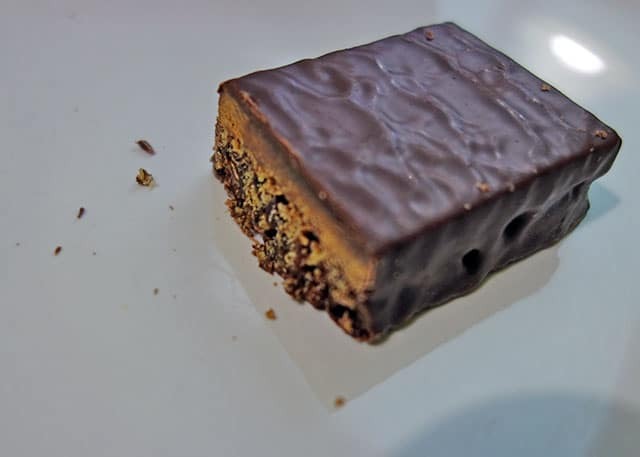 You can get a similar level of carbohydrate through much cheaper non-specific energy bars. For example Kellogg’s Nurti Grain contains around 35g of Carb, but only costs 40p. If you don’t want to pay £1.20 for 30 grams of carbohydrate, you don’t have to. The energy bars tend to be more concentrated, and relatively lower fat. I would get bored of eating Kellogg’s Nutri Grain and the like all the time. I always like to believe manufacturer’s claims that eating their energy products will make me go ‘15% faster’ – even if it is rather a dubious claim! It’s handy to buy a big box of 24 energy bars. You always have something in stock to take on long rides. Contains slow release carbs, = brown rice, oats and maltodextrin for slow release energy. Some electrolyte (sodium) + vits and minerals, such as magnesium. 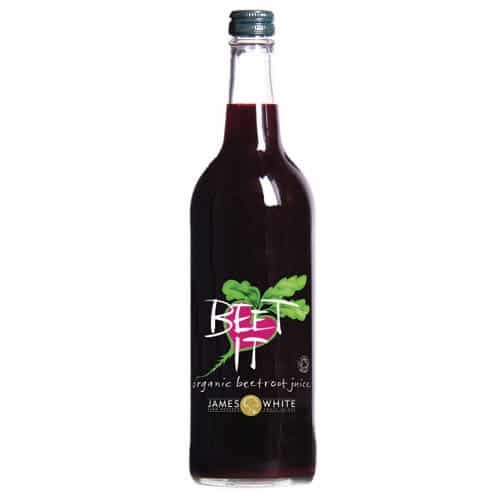 Review: Quite concentrated energy source. Needs a bit of chewing and you need to take some water with it. I do like the taste of the chocolate variety. Not too sweat. Good for long rides, and very thin for slipping in back pocket. One of most expensive though. I wouldn’t use in a race, because it does slow you down a little chewing through the bar. Review: These are pretty enjoyable to eat. They are moist and tasty. This is important for long rides, where you often need something attractive to get you to eat. 30 gram of carb makes it easy to calculate – 2-3 an hour. I wouldn’t just rely on eating these on a very long ride, it becomes a bit too much fruit.